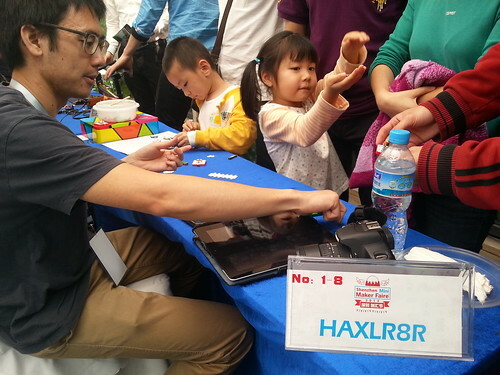 Last week-end we just had a good time at the Maker Faire of Shenzhen, hosted in the wonderful OCT District. 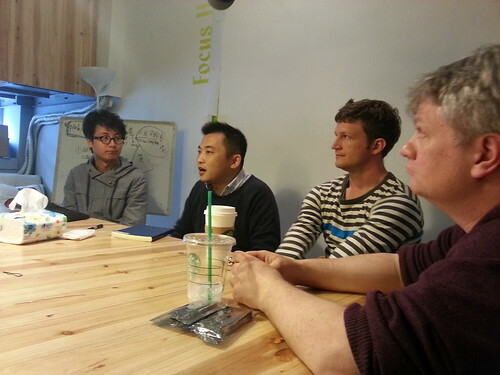 We were invited by Eric Pan from Seeedstudio (thanks Eric for the good time!). 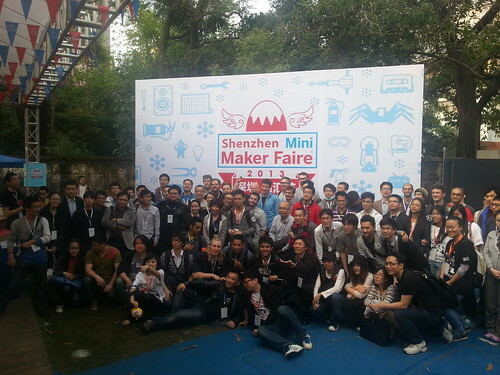 The Maker Faire has been a priceless experience to get in touch with the chinese maker community, as well as networking with different Chinese and Chinese-based maker companies creating interesting contents & products. We finally inaugurated our very first official Weibo account, and shared chinese materials about Arduino. You could come and play with the Esplora as well as code your very own interface, Thanks to our friend Federico Musto and Anna Kao for the help. and Maling and Terry who volunteered for us in the booth giving Arduino goodies and pins to a ton of interested chinese makers and curious. Zack Smith, working now in the HAXLR8R, joined us for some help to test his chinese language. There has been many speeches and presentations (as well as an Arduino workshop held by Guo Haoyun, the chinese translator of Getting Started With Arduino), and all of a sudden I understood I have to learn chinese (!). The guys of Haxlr8r showed us their cool creations: Haxlr8r is a startup incubator taking cool ideas and startups from around the world and helping them developing and fine tuning their own product (solve all the puzzles in developing a project, 3 to 6 month) for production here in China. They are based closed to the world famous SEG Electronics Market, widely portrayed from Bunnie Wang in this post and from Evil Mad Scientist here. On Sunday (totally drained out from the previous day) we teamed up with the Trasfabric “Hacked Better” workshop, we visited Chaihuo Makerspace in OCT where Tom Igoe, Zack Hoeken Smith, Gao Lei, Eric Pan (Seeedstudio) talked about maker movement and DIY culture in China, with Silvia Lindtner (ISTC & Fudan University) and Anna Greenspan (NYU Shanghai), organizers of the workshop. Shenzen is the Hollywood of hardware products, where big companies are just like the big Majors: that’s where independent, low-budget movies come out. (movies = products, boards). Zack and Eric, as well as Tom, talked about the the value of Brand, both as Market Identity and Responsibility. Zack: It looks a bit like a recipe. Hambuger. Everybody makes an hamburger. You can go to McDonald / Burger King or in the finest place. You can make it yourself. What are you hungry for? Basically open sour(c)e hardware can get everybody be the very personal cook of themselves, or at least acknowledges, with different tools and know-hows, the audience (maker movement, kids, any of us). P.S. please keep an eye on the Transfabric blog to a more comprehensive and less informal sum-up of the workshop, I’m just the one who loves Cinema, Hamburger and Open Source Hardware. First I want to say this is really cool. I have been to Shenzhen many times, it’s a great city and I am impressed that people there are getting into DYI. Second the spelling is Shenzhen not Shenzen. Shenzhen is the standard Pinyin (phonetic) spelling. Hello There. I found your weblog the usage of msn. That is a really well written article. I’ll be sure to bookmark it and come back to learn extra of your helpful information. Thanks for the post. I will definitely comeback.